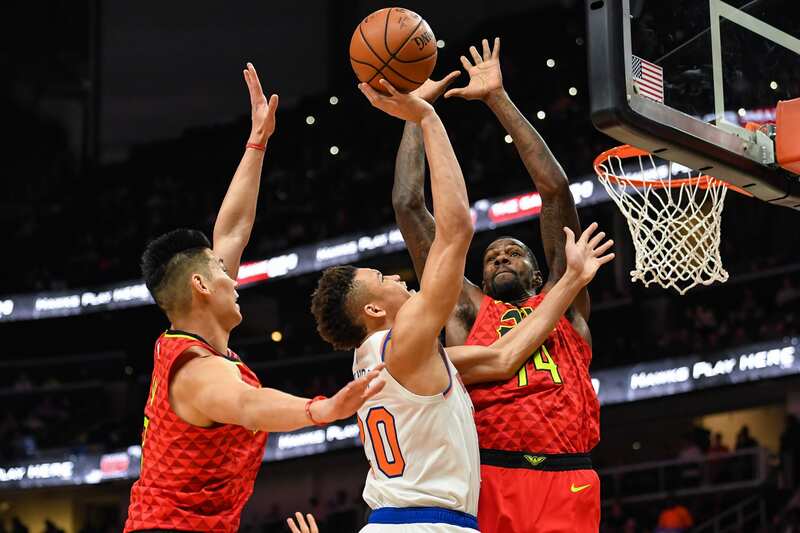 The New York Knicks beat down the Atlanta Hawks, to get their second road win against arguably the worst team in the NBA. The Knicks won’t win many games this year INJECT ZION IN THE GARDEN DIRECTLY INTO MY VEINS, but when they do, they’ll predictably come against weaker teams, such as the Hawks. This game began as expected, with a slow pace between two bottom teams in the Eastern Conference. The mini (off court) sub-plots were available for those interested such as Tim Hardaway Jr. returning back to Atlanta, Hawks revenge game from the Knicks home opener and first game of the season, Trae Young against Frank, and of course the legend Vince Carter… who showed no shame standing and cheering on the bench for Trier, as he crossed up the highest paid player on the Hawks, Kent Bazemore. Again, this game was another tale of two halves for the young Knicks. New York went into halftime down by 3 and led by as many as 16 during the second half. The team came out hot in the second half, putting together an amazing 35-18 third quarter that put the game virtually out of reach for the hometown Hawks. The Knicks were lead to victory on the shoulders of their highest paid player and volume shooter, Tim Hardaway Jr. THJ sparked the team with 34 points, 3 steals, 3 assists, and 20 free throws, 6 free throws away from a Knicks franchise record. However, anybody that watched the game knows the box score is a little deceiving as Hardaway had many questionable decisions and poor shots. The evidence, 3-11 from downtown, which just won’t cut it against better competition in the NBA. Please proceed to the back of the line and remember to keep all hands and feet in the car as you ride the ISO-ZO bandwagon!! The only undrafted player in NBA history to score 90+ points in their first 9 games… you guessed it… Allonzo “Iso-ZO” Trier. The rookie dropped 16 points off the bench had a highlight crossover on All-Star defender Bazemore. Many have compared John Starks to Allonzo Trier, mostly because of the whole undrafted shooting guard, 6th man, chip-on-the-shoulder attitude they both possess on the court. However, although Starks is my favorite Knick of all-time and still my NBA Jersey of choice (polyester blue with the black sides, of course), it is pertinent for Zo to not adapt Stark’s erratic behavior, especially in crunch time. There is still a lot to learn for the young rookie and the Knicks fans are along for the ride. Nobody is happier about Trier and Robinson killing it on the court, than rookie 1st round pick, Kevin Knox, who could not make a shot during the game… literally. The interesting 4th quarter stat of the young season is the Knicks have had a lead or tie in every 4th quarter this season, besides in the Miami Heat blowout. However although that sounds great, going into this Hawks matchup, the Knicks were -4.7 in the 4th quarter and 3-8 overall on the season. Noah Vonleh and Enes Kanter held their own verse the Hawks by recording double-doubles with points and rebounds. Meanwhile Dotson, Robinson, and Mudiay filled in their roles beautifully as they did their jobs and did the dirty work the Knicks will need to get W’s. In other news, Trey Burke did not get off the bench today in a coaches decision which does not bode well for the journeyman guard, who has had stints with the Westchester Knicks has recently as last season. The French Prince put on a clinic on the road today for all his haters, with a huge three pointer to stop the hawks leading with 5:27 left in the 4th quarter bringing his stat line to an efficient 14 points, going 50% from the field and 3pt land, while tacking on 3 rebounds and 3 assists. That possession was quickly followed by a terrible, and I mean just straight awful, foul call on Frank, that ejected him from the game with six fouls. The referees were on Frank’s case all night and really kept him out of rhythm all game, despite playing spectacular defense on Trae Young all night. Steve Kerr won’t talk about Zion Williamson, the rookie Duke phenom, during postgame pressers and Frank won’t talk about referees, so they don’t get fined. Thankfully, I don’t have to worry about either of those obstacles. Zion is the truth and the referees working the Hawks Knicks game were simply, awful. There… I said it. Knicks fans have a right to feel like pretty good right now as the team is starting to get a rotation down and it at least feels like the players are gelling together. Unfortunately these temporary emotions might be running out soon because New York is about to go through a rough stretch. It’s probably in the Knicks PR advantage that College Basketball season has officially kicked off. That’s a rough travel for anybody, let alone the youngest team in the NBA. Yes, i’m aware they’re flying on private aircraft, but theres’s no doubt about it… the first year head coach of the Knicks and the rookies will age in NBA years this week, and hopefully the veteran cast of Kanter, Thomas, Lee, and Hardaway will keep the Knicks from falling off the rails, led by the man at the helm Coach Fizdale. Speaking of Courtney Lee, what is going on with the veteran shooting guard? Lee has been nursing a neck injury and has yet to see the floor this year. There does not seem to be a sense of urgency to get Lee on the floor, especially with the young guards developing the way they are. That is probably why the media has seemed to brush off a stagnant veteran guard, who was a big free agent signing for the Knicks just a couple of short years ago. From a bird’s eye view, Courtney Lee seems to be relishing in his mentorship role on the Knicks bench during games.